Odontogenic Cysts; Nonodontogenic Cysts; Cystectomy. Objectives: Orofacial cysts are broadly divided into odontogenic and nonodontogenic types, epithelial or non-epithelial, and developmental or inflammatory in origin. The odontogenic cyst is an osseous-destructive lesion that most commonly affects the jaw. It is formed by activation of odontogenic cell rests entrapped within the bone or gingival tissue of the jaws, such as the epithelial remains of Malassez, the dental lamina (cell rests of Serres), or the enamel organ. Methods: We performed a retrospective study of all histologically diagnosed cysts of the orofacial region seen at the Maxillofacial clinic of the Ahmadu Bello University Teaching Hospital, Nigeria, between January 2003 and December 2012. Results: Over the 10-year study period, 64 cases of cystic lesions of the orofacial region were seen in 1162 pathological specimens, representing 5.5%. Of these, there were 35 (54.7%) lesions in males and 29 (45.3%) in females giving a M:F ratio of 1.2:1. The age of the patients ranged from 4–64 years old (mean = 26.3 years). Dentigerous cyst (n = 21; 32.8%) was the most predominant lesion followed by periodontal (n = 12; 18.8%) and radicular cysts (n = 10; 15.6%). Conclusions: Cysts of the orofacial region are common in this environment and like previous studies from Nigeria odontogenic cysts are not uncommon, the most predominant being dentigerous cysts. True cysts of the orofacial region are those lined with epithelium (e.g., dentigerous cyst) while those not lined by epithelium are referred to as pseudocysts. Typical examples are the solitary and aneurysmal bone cyst and mucous extravasation cyst.4 Cysts, especially epithelial types, are more commonly seen in jaw bones than other parts of the body because of numerous epithelial rests that develop an intimate relationship with developing bone. A search of the literature has revealed various classifications of orofacial cyst.4 There have been few reports on the presentation of cyst in Nigeria. This study analyzes the types and pattern of presentation of 64 cases of orofacial cysts seen in a Nigerian referral center. 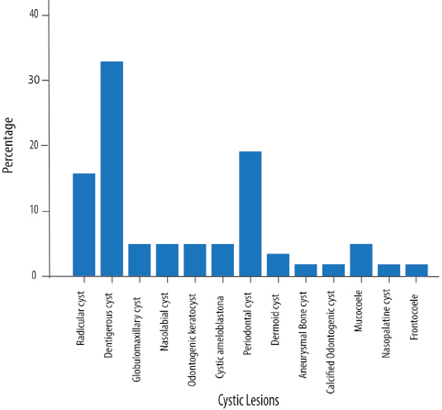 Figure 1: Percentage of cystic lesions by type. A retrospective study of all orofacial lesion diagnosed histologically as cysts seen at the Maxillofacial Clinic of the Ahmadu Bello University Teaching Hospital, Nigeria, between January 2003 and December 2012 was undertaken. Cysts diagnosed as OKC were included in the study. Information concerning cyst type, age at the time of diagnosis, and gender of patients were retrieved. Data was analyzed using SPSS Statistics (SPSS Statistics Inc., Chicago, US) version 13. The results were presented as frequencies and percentages for discrete variables, and mean and standard deviation (SD) for continuous variables. Statistical significance was set at a p-value < 0.050. Table 1: Distribution of cystic lesions of the oral and maxillofacial region according to gender. X2 = 23.47; p = 0.002. Table 2: Distribution of cystic lesions according to age. X2 = 56.44; p = 0.801. Over the 10-year study period, 64 cases of cystic lesions of the orofacial region were seen out in 1162 pathological specimen submitted, representing 5.5%. Of these, there were 35 (54.7%) lesions in males and 29 (45.3%) lesions in females giving a M:F ratio of 1.2:1. The age of the patients ranged from 4–64 years old, with a mean age of 26.3±13.9 years. The most predominant cyst type was dentigerous (n = 21; 32.8%), followed by periodontal cyst (n = 12; 18.8%) and radicular cysts (n = 10; 15.6%) [Figure 1]. The gender distribution was significant (X2 = 23.5; p = 0.002) with certain lesions such as the dentigerous cysts and OKC having a male predilection. In contrast, periodontal and radicular cysts were found to be more common in females [Table 1]. There was a wide age distribution of the cystic conditions, spanning from the first to the sixth decades of life with more lesions occurring in the second and fourth decades [Table 2]. However, the age group distribution was not significant (X2 = 56.4; p = 0.801). The most common clinical feature was swelling, which was found in all patients. Others included spontaneous drainage of fluids, infection, pain, teeth mobility, and paresthesia. A combination of these complaints was found in a large number of patients. The majority of radiological appearance images were unilocular (n = 53; 82.8%). Others were unclear since we only used plain radiographs. All patients underwent marsupialization, cystectomy, and resection. The majority (n = 59; 92.2%) were carried out under general anesthesia and the rest (7.8%) under local anesthesia; 73.4% were odontogenic cysts and 26.6% were nonodontogenic. Of the odontogenic cysts, 78.7% were developmental and 21.3% inflammatory. The mean age of patients was 26.3 years (range = 4–64 years). This was similar to previous studies conducted in Nigeria and India.3,4 However, the mean was much lower than the mean age of 36.7 years observed by Oti et al2 in Ghana. Radicular cysts are inflammatory cysts from the rest cells of Malassez.12 Also called periapical cysts, radicular cysts, are the most common inflammatory cysts and derive from the residues of epithelium after necrosis and death of the pulp from apical periodontitis.3 They represented 15.6% of cysts in this study, which was lower than that reported in Turkey (59%),12 Portugal (48.4%),7 and India (69.3%).3 The study conducted in Ibadan found that these cysts constituted 50% of all inflammatory cysts.4 Commonly found in those aged 20 to 60 years old, radicular cysts are rare in children less than 10 years of age.12 This was corroborated by our findings, with most radicular cysts presenting between the second and fourth decades of life. Radicular cysts were found to be more common in females in this study, which corroborated with Selvamani et al3 but was contrary to Koseoglu et al,12 who found a male preponderance. Periodontal cysts in this study were the second most common (18.8%) cysts. They constituted 7.6% of cysts in the study from Ibadan.4 According to Monteiro et al,7 these results are more population-based than character-based. The most common nonodontogenic cysts were globulomaxillary, nasolabial, and mucocele (21.4% each). Oti et al,2 reported a nasolabial cyst as the most common nonodontogenic cyst at 61%, which is far above the 21.4% in this study. It has been said that cysts are a result of unintentional findings.7 In this regard, 36.0% of cases by Monteiro et al,7 in India were radiological findings. This was, however, not the case in our study as none of our patients was an accidental finding. Cysts of the orofacial region are common in this environment and like previous Nigerian studies odontogenic cysts are not uncommon, the most predominant being dentigerous cysts. However, our findings differed from previous reports, especially within Nigeria, in that periodontal cysts were the second most commonly occurring cyst and not radicular cysts. Manor E, Kachko L, Puterman MB, Szabo G, Bodner L. Cystic lesions of the jaws - a clinicopathological study of 322 cases and review of the literature. Int J Med Sci 2012;9(1):20-26. 2. Oti AA, Donkor P, Owusu-Afriyie O. Orofacial Cysts at Komfo Anokye Teaching Hospital, Ghana. Surgical Science 2013;4:65-67. 3. Selvamani M, Donoghue M, Basandi PS. Analysis of 153 cases of odontogenic cysts in a South Indian sample population: a retrospective study over a decade. Braz Oral Res (São Paulo) 2012 Jul-Aug;26(4):330-334. 4. Lawal A, Adisa A, Sigbeku O. Cysts of the oro-facial region: A Nigerian experience. J Oral Maxillofac Pathol 2012 May;16(2):167-171. 5. Iyogun CA, Ochicha O, Sule AA, Adebola RA. Jaw Cysts in Kano: Northern Nigeria. International Journal of Oral & Maxillofacial Pathology 2013;4(3):08-12. 6. Oji CH. Statistical observations on jaw cysts in Enugu, Nigeria, 1987-1996. Odontostomatol Trop 1999;22(85): 33-36. 7. Monteiro L, de la Peña J, Fonseca L, Paiva A, do Amaral B. Odontogenic cysts - A descriptive clinicopathological study. Braz J Oral Sci 2005;4(12):670-675. 8. de Souza LB, Gordón-Núñez MA, Nonaka CF, de Medeiros MC, Torres TF, Emiliano GB. Odontogenic cysts: demographic profile in a Brazilian population over a 38-year period. Med Oral Patol Oral Cir Bucal 2010 Jul;15(4):e583-e590. 9. Meningaud JP, Oprean N, Pitak-Arnnop P, Bertrand JC. Odontogenic cysts: a clinical study of 695 cases. J Oral Sci 2006 Jun;48(2):59-62. 10. Tortorici S, Amodio E, Massenti MF, Buzzanca ML, Burruano F, Vitale F. Prevalence and distribution of odontogenic cysts in Sicily: 1986-2005. J Oral Sci 2008 Mar;50(1):15-18. 11. Ali MA. Biopsied jaw lesions in Kuwait: a six-year retrospective analysis. Med Princ Pract 2011;20(6):550-555. 12. Koseoglu BG, Atalay B, Erdem MA. Odontogenic cysts: a clinical study of 90 cases. J Oral Sci 2004 Dec;46(4):253-257. 13. Li TJ. The odontogenic keratocyst: a cyst, or a cystic neoplasm? J Dent Res 2011 Feb;90(2):133-142. 14. Yaman Z, Suer BT. Clinical comparison of ultrasonic surgery and conventional surgical techniques for enucleating jaw cysts. Int J Oral Maxillofac Surg 2013 Nov;42(11):1462-1468. 15. Nuñez-Urrutia S, Figueiredo R, Gay-Escoda C. Retrospective clinicopathological study of 418 odontogenic cysts. Med Oral Patol Oral Cir Bucal 2010 Sep;15(5):e767-e773. 16. Farah CS, Savage NW. Pericoronal radiolucencies and the significance of early detection. Aust Dent J 2002 Sep;47(3):262-265. 17. Etti T, Gsau M, Saber R, Reichert TE. Jaw Cysts. Filling or no filling after enucleation? A review. J Craniomaxillofac Surg 2012;40(6):4485-4493. 18. Rubio ED, Mombrú CM. Spontaneous Bone Healing after Cysts Enucleation without Bone Grafting Materials: A Randomized Clinical Study. Craniomaxillofac Trauma Reconstr 2015 Mar;8(1):14-22.